This page explains the backgrounds of the Kenya election violence. Also see my separate pages about current travel advice, a timeline of the events, the details of the power-sharing deal and the official election results. On December 27th, 2007 elections took place for which the campaign had been going on for a full year. The main candidates were sitting President Mwai Kibaki and his challenger, Raila Odinga. Some of Kibaki’s policies were well received: there has been some economic growth, he introduced free and compulsory primary education and he respected the "no" outcome of the 2005 referendum on a new constitution which would have given him more power. The media and ngo’s had much more freedom compared to the previous regime (even when The Standard newspaper was raided by government security forces). Kenya was taking some big democratic steps forward. 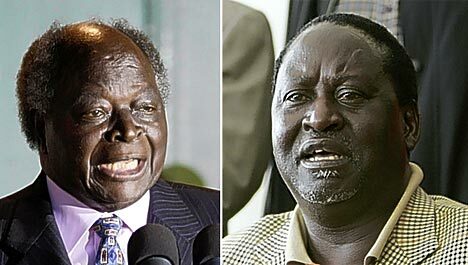 The main actors in the Kenya election violence: Kibaki (left) and Odinga. But Kibaki was criticized as well for not fulfilling his big promise on which he was elected in 2002 -- fighting the rampant corruption, especially tribal corruption. Instead, under Kibaki the tradition of corruption that was already started by Kenya’s first president after independence, Jomo Kenyatta. Corruption plagues the Kenyan economy. The ngo MS Kenya estimates that 42% of the country’s GDP consists of fraud. Donors estimate that some US$ 1 billion were lost to corruption in the 5 years of the Kibaki administration. His administration spent US$ 12 million on new Mercedes cars in the first 18 months of the administration alone. Kibaki sharply increased the salary of members of parliament and divided almost all government posts among members of his own Kikuyu tribe. These people are called the “Mount Kenya Maffia” in Kenya, after the region where the Kikuyu originate. Kibaki even wanted to increase his own salary to US$ 40,000 a month, but this was simply too much. He had to give this up after fierce protests. All this while half of the population makes only US$ 1 a day, or less. A lot of this corruption is based on tribes. Tribe members give each other jobs and cover each other’s crimes. The Kikuyu (the largest tribe with 22% of the population) have been the dominant tribe in Kenya. Partly, they have won positions on their own merits. Kikuyu are known as hard workers, and have embraced education often more than other tribes. They were also dominant between those that led the independence struggle against the British, and this way they naturally became the country’s leaders after independence. Kenya’s first president, Jomo Kenyatta, was a Kikuyu. But one can question whether current Kikuyus can claim merit because their fathers led a liberation struggle, and once in the possession of influential positions, they often abused those positions for fraud and favoritism. An important thing is the land conflicts. Under colonization, white settlers had taken fertile parts of land in the Rift Valley province in western Kenya from tribes like the Kalenjin, Masai and others. After independence, Jomo Kenyatta let members of his Kikuyu tribe buy this land at favorable conditions, instead of returning it to the communities from which it was taken. The resentment this created, lives on to this day. The riots against the Kibaki administration of early 2008 were nowhere as severe in the Rift Valley. While the riots in the rest of Kenya were spontaneous, there are indications that the riots in the Rift Valley province were carefully planned by, among others, Kalenjin politicians. Raila Odinga is from the Luo tribe. In the long campaign up to the 2007 elections, Odinga managed what no other politician was able to do before: uniting the many smaller tribes against the Kikuyu. While Kibaki had a lead in the polls during the first half of 2007, in the second half Odinga passed him. Just to show how tribe places a role in Kenyan politics: Luo aren’t considered to be ‘real men’ by many Kikuyu and some other tribes, because they don’t practice circumcision. So they cannot allow a Luo to become president. When there were clear indications that Kibaki stole the elections of his rival Odinga, the Kenya election violence began. One of Odinga’s proposals was to introduce a type of federal government (majimbo), which would have decentralized Kenya’s government and given more freedom to the other tribes in the country. Kenya has a very strong central government. At one point, the mayor of Nairobi had to get each expenditure of over 10,000 Kenyan shillings (US$ 150) specifically authorized by the national government. Kenya’s smaller tribes have been asking for majimbo since Kenya’s independence, and it has been refused by all governments since. In fact, the modern state of Kenya as such is an artificial construct that has been installed by the British colonizers. Ever since, tribes have been fighting over control of the national government. After long talks mediated by former UN Secretary Kofi Annan, Kibaki and Odinga signed a peace deal which allows Kibaki to remain president of a broad coalition government with Odinga as prime minister. A re-run of the elections would have been better, in my opinion, because the deal does acknowledge somebody as president who may not deserve that. That’s giving a bonus to fraud. But it’s a good thing that there's an end to the Kenya election violence now. The first tourists (who bring in $1 billion dollar annually, the biggest source of foreign income) are returning to Kenya.